It's 1963, and the future isn't what it used to be. As Hector dogs Ian's heels through the far-flung cities of the world, he discovers Fleming is secretly determined to right their one shared intelligence failure: "Operation Flea"—the key to a bio-weapon of terrifying scope that could bring Britain and America to their knees. This is the penultimate Hector Lassiter literary thriller in the Edgar®/Anthony-awards nominated series BookPage declared "wildly inventive" and The Chicago Tribune calls "most unusual, and readable crime fiction to come along in years." "Set in 1962, McDonald's fine ninth Hector Lassiter novel takes the 62-year-old writer and an old friend of his, 54-year-old Ian Fleming (the creator of James Bond), to Japan... McDonald pays frequent homage to Fleming and his novels, while Lassiter, like an aging James Bond, foils assassins and follows a trail that leads from Japan to Turkey... A brief coda sets the stage for the next and, unfortunately, last Lassiter novel, Three Chords and The Truth." 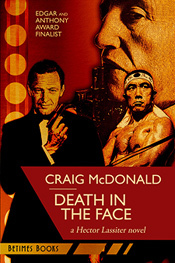 "There is one novel I've been waiting for that I'll devour immediately, the latest in Craig McDonald's Hector Lassiter series, Death In The Face. Lassiter and Ian Fleming team up for one last international caper to 'live what they write and write what they live.' And if you can deliver an audio version narrated by Tom Stechshulte, I'll never ask for another thing again ever." "In this, the ninth outing featuring the writer 'who lives what he writes and writes what he lives,' Lassiter hasn't lost a step. Rubbing elbows not only with (Ian) Fleming, but also with actors Sean Connery and Robert Shaw, and Japanese author-poet Yukio Mishima, Lassiter dodges bullets and explosions, and the set piece here involving a pool of crocodiles is alone worth the price of admission. McDonald's Lassiter stories represent a sorely needed throwback to ultra-hard-boiled adventure tales, and while the series is winding down (it) hangs together as a multi-volume biography of the greatest fictional pulp writer ever created." "This latest in Craig McDonald's Hector Lassiter series—Death In The Face—is perhaps his finest... Like all the previous books in this series, McDonald sheds light on some of the most important literary figures of the past near-century on a personal level via the Hector Lassiter character and his adventures and that alone is worth the price of admission... Like all the other literary figures who grace the pages of the Lassiter novels, delivers to the reader a delightful perspective on their lives not to be found elsewhere. A remarkable read, a remarkable author and a remarkable portrait of an interesting literary figure. Highly recommended."